In 1839, Samuel Cunard establishes the British and North American Royal Mail Steam Packet Company - known as Cunard Line - principally to carry the Royal Mail to Canada and the USA. In 1840, Cunard's first ship, the Britannia, enters service. In 1906/7, the liners Lusitania and Mauretania are launched. The latter holds the Blue Riband for the fastest Atlantic crossing for 22 years. On 15 April 1912, the Carpathia rescues survivors from White Star's Titanic. In 1934, the 80,744gt Queen Mary was launched and after entering service in 1936 soon gains the Blue Riband. The Queen Mary was the first merchant vessel to be launched by a member of the royal family, Her Majesty Queen Mary. In 1938, the largest liner to date, Queen Elizabeth, is named by Her Majesty Queen Elizabeth. During the following years of war, the two liners are being deployed as troop carriers. After the war, the two Queens begin their transatlantic shuttle, carrying tens of thousands of passengers, from film stars and diplomats to businessmen and tourists. In 1939, Mauretania (II) enters service, and ten years later Cunard's first cruise ship, the Caronia starts on her voyages across the seas. In 1967, Queen Elizabeth 2 is launched by Her Majesty The Queen. QE2, in the age of airplanes now the only ship to offer transatlantic service, goes on her maiden voyage in 1969. In 1971, Trafalgar House PLC takes over the Cunard Steamship Company. In 1976 and 1977, Cunard Countess and Cunard Princess are launched. In 1983, Cunard purchases Sagafjord and Vistafjord from Norwegian America Cruises which brings the fleet to five vessels. In the same year, Cunard charters Concorde for the first time. In 1986, Cunard acquires Sea Goddess I and II, thus bringing the fleet up to seven ships. In 1993, Cunard enters into a joint venture agreement with Crown Cruise Line involving Crown Dynasty, Crown Jewel and Crown Monarch. In 1994, the Crown Monarch leaves the fleet and the highly rated cruise ship Royal Viking Sun joins it. In 1995, Cunard Princess and Crown Jewel leave the fleet. In 1996, the Norwegian conglomerate Kvaerner acquires Trafalgar House. Sagafjord and Cunard Countess leave the fleet, so does Cunard Dynasty a year later. Sagafjord is bought by SAGA and becomes the Saga Rose. In 1998, a Carnival Corporation-led consortium purchases Cunard from Kvaerner and merges the company with Seabourn Cruise Line to form Cunard Line Ltd. In June, the new company announces "Project Queen Mary" - a proposal, to build the biggest passenger liner ever. On 9 March 2000, Cunard signs a letter of intent with Chantiers de l'Atlantique in France for Queen Mary 2. On 6 November 2000, Cunard signs the final contract for QM2 and unveils key design details. On 16 January 2002, the first steel is cut to mark the formal start of construction of Queen Mary 2. The keel is laid on 4 July 2003. Cunard confirms that QE2 will be removed from transatlantic service in April 2004 and QM2 will assume the role of Cunard's transatlantic carrier. QE2 will cruise out of Southampton. On 21 March 2003 QM2 is floated out of the building dock. On March 31, Cunard announces that there will be another Cunarder named Queen Victoria. Her keel is laid on 12 July 2003. In December 2003, QM2 is handed over to Cunard and arrives in Southampton. On 8 January 2004, Queen Mary 2 is named by Her Majesty The Queen, and on 12 January QM2, Cunard's new, superlative 151,400gt flagship sails on her Maiden Voyage to Fort Lauderdale. Planned for 2004 is Caronia's departure from the fleet to join SAGA. 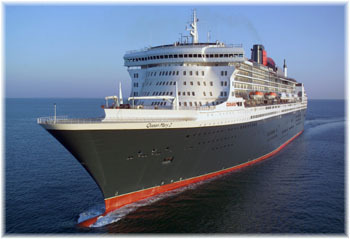 Queen Mary 2 is the largest passenger ship ever built, rising 237 feet from the base of the keel to the top of her funnel. At 1,132 feet, QM2 is 147 feet longer than the Eiffel Tower is tall - as long as four football fields. The elegant, external lines are unmistakably taken from Cunard's transatlantic liner tradition and QE2. Concessions had to be made, though, as some of the sleekness has lost its impact due to the fact that 73% of all cabins have balconies. Furthermore, the squat funnel couldn't be scaled up to QE2's proportions as it would have prevented the ship from passing under the Verrazano Narrows Bridge in New York. In order to propel QM2 at speeds of up to 30 knots, the ship is powered by four electricity generating diesel engines and two gas turbines. Each diesel engine, located low down in the ship due to their size and weight, produces 16.8 MW of power. The gas turbines are situated below and behind the funnel and only run when the ship needs to achieve higher speeds. QM2's engines produce the thrust to launch a Boing 747! QM2 features four Mermaid pots built by Rolls Royce-owned Kamewa and Atstom Powers Motors. She is the first passenger ship driven by four pods. The forward two pods are fixed in place while the aft two are able to turn 360 degrees in order to steer and maneuver the ship. Each of the pods weighs 250 tons - the largest and most powerful ever made at 21.5 MW each. QM2 has three thrusters of 3.2 MW each, allowing her to turn in port without the use of tugs. These operate with a fingertip touch by an officer on the Bridge. The ship can even keep her position stationary over a fixed spot by use of satellite and wind gauges. The system involves the pods at the rear of the ship and the thrusters at the forward end. Four folding fin stabilizers reduce the ship's roll by 90%. QM2's normal cruising speed is 24-26 knots, with the power obtained from the four diesels. Her maximum speed is approximately 30+ knots, obtained from both the diesels and the gas turbines. The passenger cabins, 1,310 altogether, are mostly located in the upper part of the ship so that a maximum number (955 or 73%) has balconies. The cabins for the most part are made up of outside doubles (1,017 or 77%). All cabins feature an interactive television set with e-mail access and many other services, such as viewing today's menu or booking shore excursions. Features include digital, multi-language videos as well as music and audio titles on demand. 30 cabins (in various category grades) have been especially designed for disabled passengers. With wheelchair access, wider doors, disabled toilets and Braille signs for blind guests, QM2 offers comfort for everybody. 36 cabins have been designed for deaf or hearing impaired passengers. There are 10 different types of cabin: Grand Duplex Apartments (2), Duplex Apartments (3), Royal Suites (4), Penthouses (6), Suites (82), Junior Suites (76), Deluxe and Premium Balcony (782), Standard Outside (62), Atrium (12) and Standard Inside (281). The four Forward Suites can be combined to create one measuring 3,980 sq ft, including balcony. Grand Duplex Apartments can be joined at the lower level to the adjacent Penthouse making each 2,185 sq ft total, excluding balcony. Duplexes may be combined with the Grand Duplexes and two Penthouses measuring an unprecedented 8,288 sq ft, excluding balconies. On Deck 9 aft, the Balmoral and Sandringham Grand Duplexes are most lavishly furnished. The sweeping living quarters with extensive balcony and spectacular views over the stern include a fully stocked bar, dining area for eight, dressing room, interactive plasma screen TV and home office corner. Upstairs, the master bedroom has private exercise equipment, a second TV, two marble �his' and �hers' dressing rooms with connecting bathrooms with separate whirlpool bath and shower. (Guest bathroom with shower downstairs). Also located on Deck 9 aft are the Windsor, Buckingham and Holyrood Duplex Apartments. They are similar to the Grand Duplexes but feature slightly smaller staterooms and balconies. The open stairway in each apartment leads to the vaulted ceiling bedroom area with private exercise equipment and two connecting baths with whirlpool, shower and body jets. On Deck 10, the Queen Mary and Queen Elizabeth Suites are found right forward. A glass lift with private access transports passengers to these rooms with commanding ocean views, a fully stocked bar and dining area for eight. Features include guest bath, marble entryway and a separate whirlpool bath. The adjacent Queen Anne and Queen Victoria Suites are the same but without balcony. 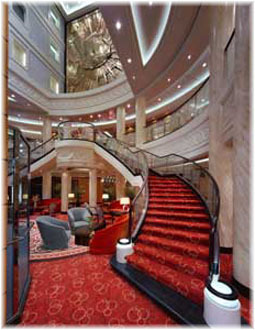 As soon as passengers embark into the ship's six-storey Grand Lobby with its elegant staircase and artwork, the imposing interior design becomes obvious. Traditional and modern elements meet but never clash. On the contrary, they compliment each other in a most stylish and harmonious way throughout the ship. 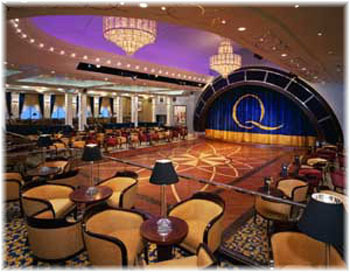 The QM2's Queen's Room on Deck 3 for example is reminiscent of QE2. With a dramatic high ceiling, crystal chandeliers and the largest dance floor at sea, passengers can continue to enjoy the great Cunard tradition of afternoon tea, cocktail parties and ballroom dancing in style. At the aft end of the Queen's room, doors with metal decorations of a contemporary design lead to the G32 Nightclub which has been named after the hull number given to the ship by the yard. Both venues happily co-exist. Tradition lives on, as QE2 also had a night club named after her yard number when she was built - The 736. Likewise does the 156-seat Todd English Restaurant on Deck 8 offer innovative Mediterranean cuisine in a modern setting, while on Deck 2 the main dining room, the Britannia Restaurant (seating 1,347 passengers in two sittings on two levels) evokes memories of traditional ocean liner restaurants with a sweeping central staircase and classic columns, spanning the full width of the ship and nearly three stories in height. A vast tapestry of a past Cunard liner hangs as a centerpiece. Just as on QE2, each grade cabin is paired with a restaurant. 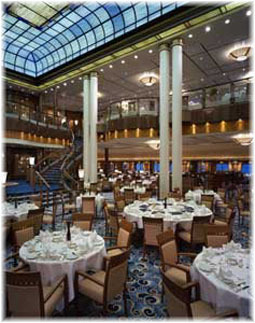 The restaurants follow a similar pattern to that provided on QE2, with Grill Rooms for the higher categories and restaurants for the deluxe and standard grades. The 200-seat Queen's Grill, located on Deck 7 aft, is decorated in gold and for the use of the passengers booked into the highest-grade cabins. These passengers also have the exclusive use of the Queen's Grill Bar and Queen's Grill Terrace on deck. Also to be found on Deck 7 aft is the 178-seat Princess Grill, decorated in silver, for passengers in the Junior Suite cabins. Both grills offer single seating. As an alternative dining experience, the informal 478-seat King's Court on Deck 7 serves breakfast and lunch buffet style. Decorated screens transform the area into four different dining areas at night: La Piazza (Italian), Lotus (Asian), The Carvery (British) and the Chef's Galley (Demonstration Kitchen). For snacks, the Boardwalk Caf� offers fast food choices outdoors and even the Golden Lion Pub on Deck 2 offers traditional English pub food for lunch. The Winter Garden, located on Deck 7, is reminiscent of a grand conservatory with flowers in bloom, a waterfall and a piano. Here, as in the Queen's Room, passengers can enjoy afternoon tea. QM2 offers a whole range of bars and clubs (14 in total) to suit a wide variety of tastes and provide a range of atmospheres, including a traditional English Pub (The Golden Lion), an up-market modern wine bar (Sir Samuel's), a nautically themed cocktail bar (The Chart Room) and the Veuve Clicquot Champagne Bar. The Terrace Bar and the Regatta Bar can be found outside. Health and fitness facilities are extensive. Covering 20,000 square feet on Decks 6 and 7, the QM2 spa is operated by Canyon Ranch SpaClub. Facilities and services include massages and therapeutic bodywork, mud, aromatherapy, ayuvedic and seaweed treatments, facials and masks, conditioning body scrubs and therapeutic body cocoons. There is also a complete gymnasium, Thalassotherapy pool, whirlpool, herbal sauna, Finnish sauna, reflexology basins and an aromatic steam room. Other than the large indoor pool in the Spa, there are four swimming pools outside. One of them can be covered by a retractable sliding glass roof, becoming an additional indoor pool if the weather is bad. 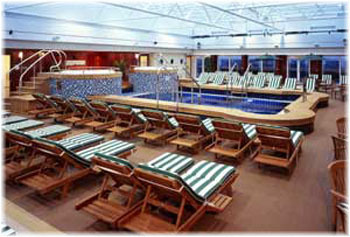 On Deck 12 a large sunning area can be found with a sports bar at one end. Sports facilities include two golf simulators, a half-size basketball court, putting green, quoits, shuffleboard, deck games, a giant chess board and a paddle tennis court. There are eight whirlpool tubs. The Promenade Deck provides a generous outdoor walking space for passengers, protected from the weather at the forward end. For entertainment, passengers are spoilt for choice. On Deck 2 the Empire Casino, the ConneXions and the Royal Court Theatre can be found. 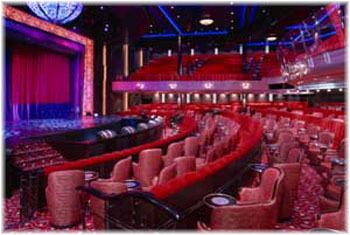 The Royal Court Theatre is the main showroom on QM2. It is decorated in red and seats 1,094 over two levels. The orchestra pit can drop and rise level with the stage to extend the performing area. ConneXions is a college at sea which offers a program of education and courses on a variety of subjects. It also features two computer learning centers, a business center and can be linked to the planetarium and the main theatre. On Deck 3, Illuminations and Mayfair shops can be found. Illuminations is the first sea-going planetarium which also doubles as cinema with virtual reality films. The forward Commodore Club observation lounge found on Deck 9 offers sweeping views over QM2's bow and features jazz music every night. Connected to this room are the Boardroom and Cigar Lounge. The Library and Bookshop, situated on Deck 8 forward, is the largest to be found at sea with 8,000 hardbacks, 500 paperbacks, 200 audio books and 100 CD ROMs. A children's play area with dedicated pool and outside play area has not been forgotten. Like Queen Elizabeth before her, Queen Mary 2 is a true liner, running a liner service between Southampton and New York. When QE2 was introduced, her external lines were thought to be unfashionably modern. Over the years, these have come to be accepted and loved by ship enthusiasts the world over. Undoubtedly, QM2 lines will also come to be cherished in the same way and associated with this great vessel.